The content of this article provides interesting history, facts and information about Processions at the Colosseum associated with the gladiatorial games. The games would have been advertised for some time on posters, Colosseum tickets (tessara) issued and excitement would have mounted. The Processions at the Colosseum would have been well organised and planned to precision timing. Costumes, musical instruments and carriages prepared and all of the parade fully briefed on exactly what was expected. All eyes would be turned to the east of the arena towards the Gate of Life where the procession would enter. The Gate of Life was connected via a tunnel to the Ludus Magnus the great Gladiator School and the gladiators would have only joined the end of procession to make their entry into the arena. The procession, minus the gladiators, would have paraded through the streets of Rome. The procession was led by slaves clothed in golden armor and blowing long trumpets. The musicians would have followed, loudly playing on horns, fifes and flutes. The 'editor' giving the games, usually to curry political favor with the 'mob', rode behind on a chariot perhaps drawn by exotic wild animals such as zebras or even ostriches. The chariot would have been surrounded by his supporters. The 'editor' was the only person who had the right to wear a purple toga and on his head would have been a golden wreath encrusted with semi-precious jewels. The wild animals drawing the chariot would be shown in magnificent harness and led by their trainers. After the chariot came the main procession consisting of spectacular floats and decorated carts drawn by horses, mules and elephants. The floats held groups of young men and girls posing to represent a mythological tableau. Acrobats, animal trainers and their animal acts, hunters and bowmen followed. Dancers in exotic costumes scattering rose petals. The main procession would have circled the arena and followed by the entry of the Vestal Virgins who took their palace directly opposite the Imperial Box used by the Emperor. The Emperor would have entered the Colosseum to the fanfare of trumpets and then taken his place in the royal box followed by a detachment of the Praetorian Guard. The entry of the gladiators came last and they would have entered through the Gate of Life to rapturous applause from the crowds. The gladiators would have been fully briefed and knew exactly what was expected of them. 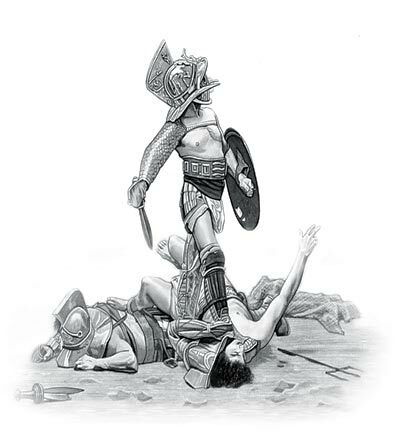 Each gladiator would be attired in specific armor and holding appropriate weapons. Some gladiators would have worn gold-embroidered cloaks. The spectators would have recognised the armor and weapons and were able to distinguish the different styles of combat that would be displayed. The entry of the gladiators would have ended as they paraded around the arena and then formed ranks in front of the Imperial Box and the Emperor. Processions at the Colosseum - "We who are about to die, salute you!" The gladiators saluted the emperor shouting the ritual chorus of "Ave imperato morituri te salutant!" which roughly translated meant "We who are about to die, salute you!". The processions at the Colosseum then led to the slaughter in the bloody arena. The content of this Processions at the Colosseum category on life in Ancient Rome provides free educational details, facts and information for reference and research for schools, colleges and homework. Refer to the Colosseum Sitemap for a comprehensive search on interesting different categories containing the history, facts and information about Ancient Rome. Just like the subject of Processions at the Colosseum there is hardly a page of Roman history and the Romans that is not, on some way, connected to the Roman Colosseum which became a symbol of Rome, its society, culture and life.